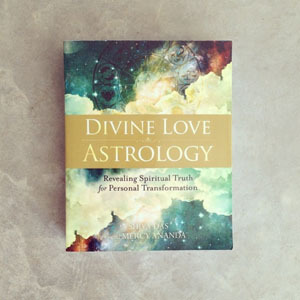 Divine Love Astrology: Revealing Spiritual Truth for Personal Transformation is a book intended to help you use astrology to discover your true spiritual essence, find inner balance and peace of mind, and reconnect with intuition. Astrology is an intuitive language, born of intuition. It is not a language of alphabets and words but of symbols and diagrams. It is a way the ancient people who discovered astrology conveyed the way they perceived life. These ancient people did not have an intellectual understanding of the nature of the universe or how life worked. They used their intuition to determine what was true. They observed Nature and the four elements, Fire, Earth, Air, and Water, and how Nature uses the forces that control these elements to maintain balance. The Zodiac is a diagram of the laws of polarities that govern the interaction of everything in the universe. Even today we know these laws on an intuitive level. So for us today astrology is a means to get back in touch with our intuition. Intuition is that which we know through our feelings rather than our rational thinking. But we have been taught not to trust our feelings and thereby have lost touch with our ability to interpret them. Feeling a feeling must be coupled with an understanding of what that feeling is trying to tell us. By revealing how the laws of polarities work in Nature, and that these laws also govern human consciousness, Divine Love Astrology can enable us to re-learn how to interpret our feelings, which are meant to be our inner guides. We are creative beyond our imagining. We are creating constantly in every minute whether we are aware of it or not. The goal of Divine Love Astrology is to help you create consciously. DLA will show you that understanding how these laws of polarities work in consciousness to motivate us is the key to creating consciously. By learning what your feelings are trying to tell you, you can begin to express yourself in ways that bring the response you desire from the world rather than that being a mostly unconscious process. Our essential true-self intuitively knows how to live in harmony with all that is, and when we learn to use our intuitive knowing we not only create harmony in our lives and find worldly fulfillment but also realize the spiritual meaning of life when we perceive the great Divine love that is behind it all. Longtime astrologers Shiva Das and Mercy Ananda take readers through every aspect of astrology, from its history, principles, components, and meanings, to its use as a tool to raise awareness and to understand possibilities in cause and effect. With nearly 180 black and white illustrations, including zodiac, primary wheel, and sign relationship depictions, Divine Love Astrology provides a thorough education in this ancient system. This essential guide embraces the immediate personal and practical applications of astrology and encompasses the broadest philosophical and universal values, guiding us from Earthly mundane to the celestial Divine. Not only do the authors teach readers the basics of the field, but they also provide them with tools to reflect and develop intuitive understanding that will aid in both reading astrology charts and living a conscious life. Divine Love Astrology will benefit those interested in becoming astrologers and help them, through the use of astrology as a contemplative science, to develop their intuition. Rather than proposing that we live our lives by astrological events or learn to stereotype people, Das and Ananda help readers get in touch with their inner knowing, enabling them to make conscious choices for themselves in the present. With its spiritual and applicable lens, Divine Love Astrology will help both professional astrologers and laypeople alike take charge of their lives from the inside out.